The onboard cameras used by these systems also can help promote safe driving and provide liability protection for fleets, according to experts who spoke at a March 19 panel discussion here at the annual meeting of the Technology & Maintenance Council, which is part of American Trucking Associations. “This is a very exciting time. We’re thrilled to see where this technology is going,” said Rick Reinoehl, senior vice president of safety and risk management at Covenant Transport. Covenant has seen a 40% drop in preventable rollovers since implementing electronic stability control and a 14% decline in trucks running off the road since adding lane departure warnings, he said. After deploying forward-collision mitigation, the fleet saw a 22% decrease in the frequency of rear-end collisions, as well as a decline in the severity of those accidents, he added. Overall, the fleet’s Department of Transportation recordable accidents dropped 23% among trucks equipped with all of those safety systems, Reinoehl said. Southeastern Freight Lines also reported significant safety gains. In 2018, the fleet’s accident rate per million miles was 2.61 on trucks without active safety technology, but only 1.05 on trucks equipped with the technology, said Chris Reynolds, director of safety and security at SEFL. To work effectively, however, these safety technologies must be installed and maintained properly. In some cases, it can be a challenge to identify maintenance problems if they occur because drivers may not report them. And drivers who dislike the audible alerts issued by the systems may even tamper with the technology to disable it, Reinoehl said. Covenant ultimately established a zero-tolerance policy to prevent tampering and had to part ways with some drivers over the issue before seeing improvement, he added. SEFL’s Reynolds said fleets can gain driver acceptance of the technology by expressing concern for their safety and sharing examples of drivers who have been exonerated by video the systems have captured. “They become believers quickly,” he said, and touted onboard video as “the most accurate witness” when determining the cause of a crash.“Without video you don’t have the same level of accountability,” he said. Covenant’s Reinoehl also said onboard video can provide clarity when the cause of an accident is under question. “There’s just no end to where technology is going to help us with our claims mitigation costs,” he said. Safety technology also can improve driving behavior. SEFL’s Reynolds cited the Hawthorne effect, where people change their behavior when they know they’re being measured and observed. Moreover, it’s important to use information captured by the technology to support driver coaching, he said. “Without a robust follow-up system, it’s only going to be sustained at a certain level because people will revert back to old behavior,” Reynolds said. But active safety systems aren’t there to be punitive; rather, they’re designed to supplement the driver, who remains the most vital element of safely operating the vehicle, said Brian Daniels, manager of powertrain and component product marketing at Detroit, which is part of Daimler Trucks North America. “100% of you do have a collision mitigation system on your trucks — and that collision mitigation system is your driver,” he said. As the systems have become more advanced, industry adoption has increased, Daniels said. The current sales rate for the Detroit Assurance safety system, available on Freightliner trucks, has reached about 75% of all new vehicles ordered, he said. Automated steering is the next stage in the evolution of safety technology. In September, the 5.0 version of Detroit Assurance will introduce active lane assist features that automatically steer a truck back into its lane after a lane drift, and can help keep the vehicle centered in its lane while using adaptive cruise control, Daniels said. 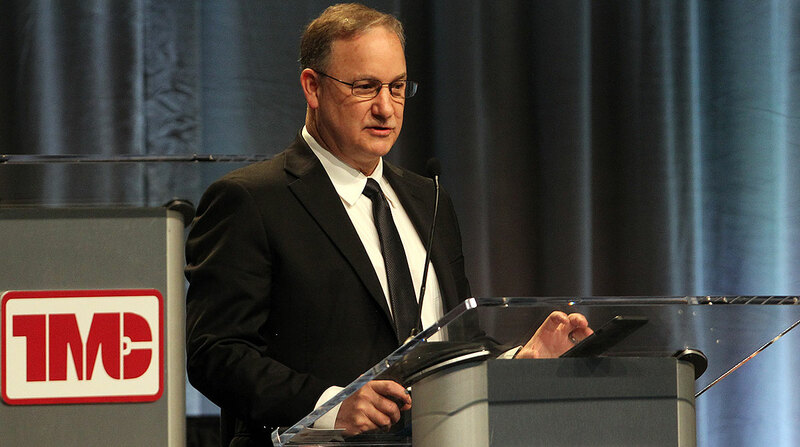 Doug Donaldson, chief engineer for steering and product innovation at Wabco Americas, said a focal point for the development of next-generation safety systems will be making them less intrusive and more intuitive for drivers, which can improve acceptance. Brad Aller, regional director for fleet sales and service at Bendix Commercial Vehicle Systems, also emphasized the importance of driver training. Fleets also should listen to drivers who complain about false activations, he added. Technical problems can stem from something as simple as a technician replacing a camera on the windshield but failing to put the bracket on correctly.